This project looked pretty simple but it ended up being a HUGE challenge and very Difficult PCR to achieve. The constraits were caused by primer design and the target’s sequence. The customer mentionned that all other high-fidelity DNA polymerases failed at amplifying full lenght CHD2 long isoform from human lymphocyte cDNA, The researcher provided us with PCR primers and cDNA. This was the most challenging PCR we ever attempted. 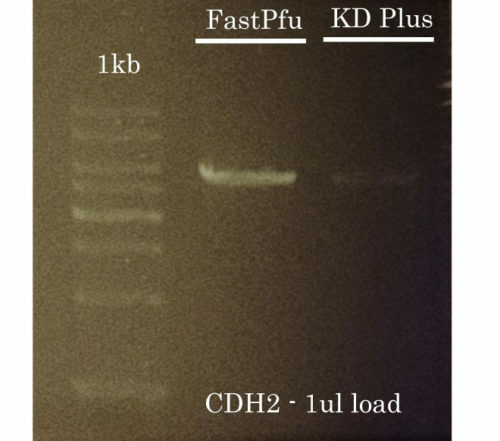 Nevertheless, we successfully amplified full-lenght long isoform of human CHD2 using TransStart FastPfu and KD Plus. The amplified fragment was confirmed by sequencing. Problems with AT- or GC-rich PCR?